1. Novellette for flute (alto flute) and harp with violin and cello ad libitum (1980). 6. Sonata for violin and piano (1991). 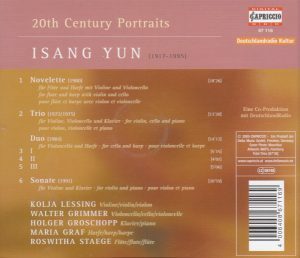 I hold Korean-born, German-adopted composer Isang Yun (1917-1995) for one of the most original and fascinating voices in late 20th century contemporary music. 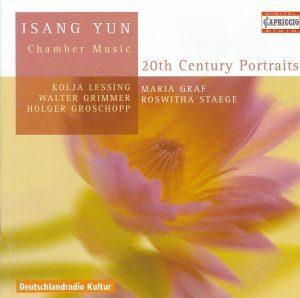 What makes the music of Yun so unique is that he invented a style combining the most demanding advances of the 20th century German avant-garde, and the melismatic traditions of traditional Chinese and Korean court music. It makes his music both sweepingly dramatic and, if you have the ear to hear it, searingly lyrical, with much ornate ornamentation in the highest registers. This CD by Capriccio (released in 2005, but recorded in 2000) is particularly valuable not only for bringing together four beautiful works, but for offering among them two compositions of Yun that are not otherwise widely available, the Piano Trio and the Sonata for Violin and Piano – although the small German label Christian Feldgen Music published another version of the piano trio two years after this one, by the Kim trio, on CFM 37, barcode 4260010638419 (with trios of Mendelssohn and Beethoven). I find the music of Yun is always wonderfully evocative, it is easy to imagine one’s own secret cinema that the music would illustrate. Sometimes, there is indeed, in the composer’s mind, a secret story behind the music, with the instruments impersonating certain characters from Korean mythology; it is also the case with Novellette (spelt by Capriccio with one L, but other versions and Yun’s own website say two), a duet for alto flute (substituting alto flute) and harp from 1980, with the flute seen as a narrator or protagonist, although here the precise story is left untold. Besides moments of greater whimsicality and vehemence, it offers moments of dreamy poetry and caressing beauty, with its busy harp, softly and delicately tinkering and at times more assertive, its two ad lib strings (violin and cello) placed at a distance, the whispering violin glissandi that seem to come from a Far-East traditional orchestra, and always Yun’s typical signature, the flute’s ornate embroidery in the high registers. The Piano Trio, a relatively early piece from 1972/75, may sound at the beginning more intimidating, with its somber attack by string followed by ominous piano chords, but immediately after ghostly moans are whispered over soft tinkering of piano, the latter later softly harping directly on the strings, and it’s easy to fantasize those ghost movie scenes Japanese or Korean cinema. The piece goes on in this hushed, mysterious and insinuating mood, until a more anxiously agitated episode at 7:44, ultimately returning to the hushed and ghostly atmosphere of the beginning. Obviously the harp was an instrument Yun was fond of. The Japanese label Camerata published not only his Concerto for Oboe and Harp, written for Heinz and Ursula Holliger, but also the Sonata for Oboe, Harp and Viola. Duo for Cello and Harp, from 1984, has a delicacy and caressing dreaminess which reminds me, more than the Sonata did, of Debussy’s Sonata for Flute, Viola and Harp, or maybe, in the more vehement, rhythmical and whimsical second movement with its dancing cello pizzicati, a mixture of that and of his Sonata for Cello and Piano. Not that it’s written in the same style, but it offers a whimsicality of phrasings and subtlety of colors very much in the spirit of Debussy. It’s also almost a piece that Britten could have composed as well in his later years, the cello suites easily come to mind. Sonata for Violin and Piano is the latest work (1991), and it is interesting for attributing Yun’s customary florid melismata, constant trills and watery springs reminiscent, in a totally different style, of Enecu’s music, as much to the piano as to the violin. Much of it is vehement and excitedly agitated, the last 9 minutes are appeased. The violin slowly works its way towards the highest reaches and the music becomes increasingly tensely lyrical, before ending in the appeased mood again. I have an earlier recording of Duo for cello and harp, by the same cellist who plays it here, Walter Grimmer, but a different harpist, Marion Hofmann instead of Maria Graf, on Aurophon/Col Legno AI 31808 CD (1991, recorded in 1987). Not surprisingly, the two versions are very similar, just a touch more urgent and vehement in the first movement on Col Legno, but the sound of the harp there is also a touch more opaque and less crystalline (not so, though, not perceptibly, in the third movement). I also have another recording of Novellette by a Dutch team on Attacca Babel. Again preference for either is very subjective, but the Attacca Babel recording affords slightly more refinement to the instruments, the harp sounds more crystalline, the “distancing” effect of the two strings is rendered with slightly more eeriness, whereas sound is thicker in the tutti fortes on Capriccio, more in your ears. The rest is a matter of which pairings you prefer, the coherent, all-flute program of the Attacca Babel CD or the more diversified program here – no criterion with the Col Legno disc, because it too is a diversified program. But, with great composers, it is permissible, and even advisable, to have more than one version. TT 68 minutes. See my Isang Yun introductory page for a discography and useful links.